Prior to the invention of the steam car, road transportation was relegated to horses and horse-drawn carriages. There was, however, an ever-growing desire to develop self-powered or self-propelled vehicles that would not rely on animals. As far back as the 1300s, inventors from Italy attempted to do just that by designing vehicles that were powered by the wind, using a windmill design. Even inventors such as Leonardo Da Vinci envisioned self-powered vehicles and had a number of sketched designs illustrating their ideas. The first steam-powered car concept was, in actuality, a toy that was given as a gift to the Emperor of China by a mathematician and astronomer named Father Ferdinand Verbiest in 1672. The invention was the result of Father Verbiests's experiments with steam. However, due to its size, his invention was not capable of carrying human passengers. The first self-propelled vehicle was powered by steam and was actually a tractor meant to haul artillery. 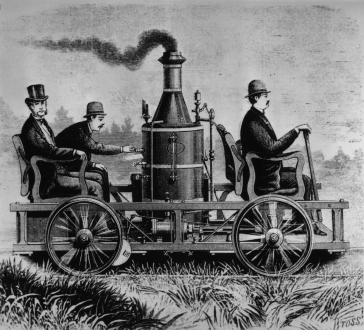 Some historians consider it to be the first steam engine car and it was developed by Nicholas Joseph Cugnot in 1769. This was a heavy vehicle that was extremely slow-moving. In addition to its slow gait, the vehicle was forced to stop every fifteen minutes to build up steam. The impracticality of Cugnots designs even made them prone to tipping. Although Cugnot eventually discontinued his work, his vehicles had an impact in terms of encouraging further development in steam engines and steam-powered cars. Cugnot's vehicles were followed by other advances in steam car technology. In 1784 William Murdoch developed a steam carriage. In 1789 Oliver Evans received the first U.S. patent for a steam-powered vehicle. Many of the advances in steam powered travel and the external combustion engine were originally made in Britain. This was hindered, however, when a law was passed in 1865 to protect pedestrians. This law required a man carrying red flags must walk ahead of any land transit, self-propelled vehicle, shifting Britain's focus from land vehicles to locomotives. Inventor Amédée-Ernest Bollée was also a major inventor of steam-powered vehicles. It is Bollée that some historians credit as being the true first creator of the steam powered automobile in 1873. Stanley Steamer vehicles were created from 1899 to 1905 by twins Freelan and Francis Stanley. The Stanley vehicles are well-received and outsold gasoline-based vehicles in the U.S. They were known for their power and their speed. In fact, they had set five world speed records in 1906. Other companies started to build steam-powered vehicles, including Locomobile and White. There were many risks associated with steam engine vehicles, such as the fear of explosions, which hindered them from becoming a success. For these reasons, the popularity of steam cars began to dwindle by 1910. The steam car reached a high level of popularity in the United States and around the world. At one time during the turn of the 20th century, the steam engine car accounted for more than half of the cars on U.S. roads. Although they eventually gave way to internal combustion vehicles in the 1920s, steam vehicles played a major role in transportation history. The development of steam cars proved that self-propelled travel was more than a possibility. It revealed the many benefits associated with this type of travel and made people hungry for more and better options. Today, steam powered cars are still honored and appreciated by numerous clubs across the United States and Britain. For more information about the history of the steam car, please review the list of links below. BBC History: Why Don't We Still Drive Steam Cars?